European Space Agency officials are using the Rosetta spacecraft to hunt for the Philae lander in this search area. Mission managers hope the lander will be warm enough to start beaming back signals from the surface of Comet 67P/Churyumov–Gerasimenko this March. The first human-made spacecraft to soft-land on the surface of a comet might be waking up soon. 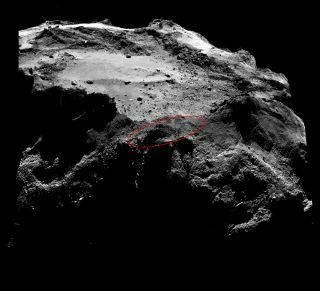 The European Space Agency's Philae lander has been in a deep sleep since November. Starting this week, however, officials at ESA will start listening for signals from the probe, which could revive when enough sunlight hits its landing site. "Philae currently receives about twice as much solar energy as it did in November last year," Stephan Ulamec, Philae's project manager at the German Aerospace Center (DLR), said in a statement. "It will probably still be too cold for the lander to wake up, but it is worth trying. The prospects will improve with each passing day." Controllers are optimistic because Comet 67P/C-G is much closer to the sun now than when Philae first made its incredible landing on the dusty body's surface on Nov. 12, 2014. Harpoons inside Philae failed to fire to secure it to the surface, so Philae drifted for two hours before coming to rest in a shadier spot than expected, nicknamed Abydos. After a few dozen hours of work, its batteries ran low and the lander entered hibernation. Philae is designed to wake up once it receives more than 5.5 watts of power on its solar panels, and its internal temperature rises above minus 49 Fahrenheit (minus 45 degrees Celsius). The spacecraft should then turn on its receiver every half-hour to listen for Rosetta. However, to "answer" Rosetta, Philae will need to have at least 19 watts of power. Meanwhile, controllers have sent commands to Philae that are intended to help the spacecraft conserve power, giving mission managers an even better chance of getting in touch with Rosetta. It's possible that not all components survived the cold as well. Philae will transmit basic information about its health once it wakes up, and controllers will make operational adjustments as needed. If the battery failed, for example, officials will plan to operate the spacecraft during the "daytime" on the comet landing site. Philae's exact landing site has not yet been identified, but controllers continue to search for it using high-resolution pictures from Rosetta and knowledge from the "solar energy conditions" Philae had in November. Both spacecraft and the comet are now 320 million kilometers (199 million miles) from the sun. Rosetta will continue listening for the spacecraft through its mission, which extends through much of 2015.